Stranger Magic is a long and erudite meditation on the meaning and influence of The Thousand and One Nights in the West. Two significant touchstones for this work are Borges’ essay “The Translators of The Thousand and One Nights” (in which Borges notes that “one of the chief events in the history of the West was the discovery of the East”), and Edward Said’s “cult bible” (Warner’s words) Orientalism, a critique of the false romanticism of the East by the West. In tracing the influence of the Nights from its first Occidental appearance in Antoine Galland’s French translation (1704-1717) and through the iterations of Edward Lane and Richard Burton, among others, Warner harvests fertile ground. Within five separate sections, she explores significant themes interspersed with retellings of fifteen stories from the Nights. As the title of Warner’s book reminds us, The Thousand and One Nights is a book of magic, although for us in the Occident, much of its magic may come from the interpretive powers of its translators (the eroticism of Burton springs most immediately to mind, although we must bear in mind that much of the spice in his retelling is contained in the voluminous footnotes). Still, as a collection of tales, it is impressive, deriving from Persian, Turkish, Chinese, Arabic, Egyptian, Indian, and God knows what other sources, and with the influence of some of the tales reaching as far as Chaucer’s England. But what is at least as impressive as the tales is the ingenious frame story: it hardly needs repeating how Sharazad saves herself from beheading by the Sultan Shariyar by entertaining her sister (and, silently, the Sultan) with stories within stories, extending through the night, through days of silence, to be resumed the next night. The doom that hovers over Sharazad is due to womanly treachery suffered by the Sultan and his brother, treachery for which all women must pay as each night the Sultan takes a virgin bride only to have her beheaded with the morning light. It is Sharazad’s accomplishment not only to save herself, but to also bend the Sultan’s distrust of women. Surely, the early stories contain their share of female treachery, but over time, Sharazad subtly introduces the theme of the pure and noble woman, capable of great love and sacrifice, and in this manner softens the Sultan’s heart (the Sultan also discovers, at the end of his thousand and one nights, that Sharazad has borne him two children!). It would be exhausting to relate the themes that Warner examines in 436 pages (not counting another hundred or so pages of glossary, notes, bibliography, and index). She touches on the medieval legend of Solomon the Wise King, a large figure in the mythology of three religions, and inspiration for countless tales of magians and alchemists; flying carpets and other enchanted objects; the description and use of talismans; the supernatural djinn; Voltaire’s Orientalist tales; Goethe’s East-West Divan; Beckford’s sublime and underknown gothic novel Vathek; flying machines; Lotte Reiniger’s silent film The Adventures of Prince Achmed; Aladdin as holiday pantomime; and the Persian carpet which adorned Freud’s couch, and upon which his patients explored their own subconscious as the tales of the Nights awaken our own. 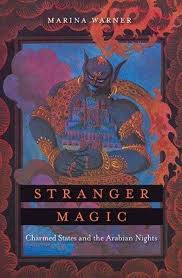 Stranger Magic is an intense book, and one demanding of attention. Obviously, some of the themes Warner flits off after will hold more fascination than others, but the possibilities of the Nights seem endless, and one can’t fault the author for taking her thoughts wherever they lead. Keep this one on the shelf next to Robert Irwin’s The Arabian Nights: A Companion, and Penguin’s superb and exhaustive recent three volume edition of The Arabian Nights in the Malcolm C. Lyons translation.